This is a repeat of a post on this website in March. But, I have added a vital illustration… a picture of the map that I use in this constant survey I am taking as I travel around the world. Perhaps, it will make the claim much clearer and easier to understand. For five long years, during two around-the-world solo trips, I’ve carried a laminated page from my Hammond World Atlas book. This “testing page” is always in my backpack; ready to be pulled out in a hostel or gathering of locals and fellow travelers. Not only is it an excellent icebreaker but more importantly, it’s a personal quest to find even one human being who has noticed the uncanny fact that the South American Andean Mountain Chain resembles the human spine. I couldn’t believe that I was the only one who had ever noticed this amazing fact! But so it seemed! 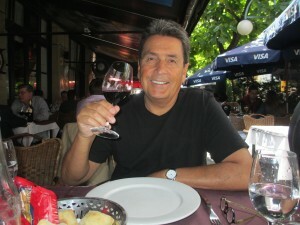 I have literally interviewed hundreds of people; if not thousands, including huge numbers of South American residents. And none had ever seen this obvious truth! 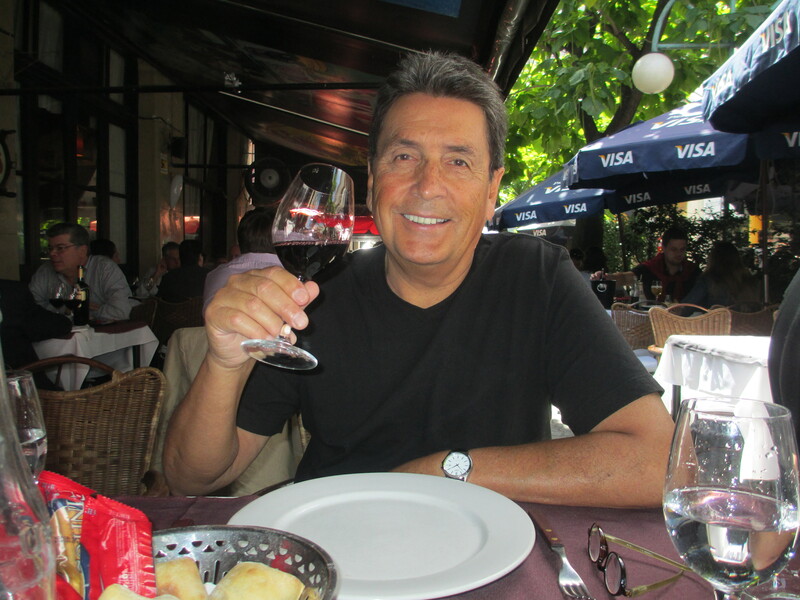 My first “victim” was a Brazilian Geologist, whom I met in Medellin, Colombia. Surely, this professional map-reading expert had spotted the similarity many years ago. But no! He was my first gobsmacked student for whom I soon became the Rorschach Interpreter. Another suspected shoo-in was a Peruvian Geography teacher. Not a clue! Year after year, I have asked….. and no one has answered! Never did I find one human being who could recognize a slightly-hunchbacked skeleton in the snow-capped mountains tracing an unbroken ridge through Colombia, Ecuador, Peru, Bolivia, Argentina and Chile. It seems so obvious to me and conclusive proof is reflected in the Sacrum/Coccyx area, where Chile and Argentina taper to an exact rendition of a tailbone. 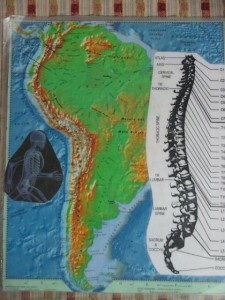 You can check any topographical map of the Patagonian east coast, from Golfo San Jorge down to the Straits of Magellan in Tierra del Fuego, and compare that with a Chiropractic profile of the spine, to become convinced of the similarity yourself! Naturally, the newly-initiated will inevitably introduce others to this new understanding. At least, they say they will. Over and over, on planes, trains and buses; on Nile Feluccas; in Siberian hostels and homestays, and naturally, in every corner of North and South America, I was the Pied Piper of our planetary vertebrae. Never, that is, until a big, handsome movie and television Producer, George Burdeau, of the Blackfeet Nation, Montana, and Santa Fe, New Mexico, sat at dinner recently, and calmly said: “Yes, of course! My Tribe has always believed that the Andes was the backbone of the planet! Did you know, also, that every organ of the body can be found, replicated in the land formations of North America?” and then he calmly buttered another piece of bread. “Every Native American Indian child knows this!” George Burdeau, Santa Fe Media Ranch, Santa Fe, New Mexico is the first human whom I have encountered to have recognized this fact. In all my random surveying; in all my world walking and talking….I had not gone to ask the Pikuni, the true native name for those original custodians of the land, whom the White World has nicknamed Blackfeet Indians. This hunchbacked spine can be noted only on a topographical map. Note the exactitude of the tailbone similarity. I will always carry my tattered wisdom test and continue my dog and pony show; but when I really want to know anything; I’ll go north to Montana and ask “The Real People.” What a relief to know I’m not alone! Meanwhile, I intend to sit down with George and all my maps, so he can teach me about the country I grew up in. Especially, the other spinal column that he speaks of, hidden in the Rocky Mountains. I always thought that that skeleton was the horse, which my “Guy” below, was riding. But, he swears it’s human. I can’t wait to see that new Rorschach picture, which I haven’t yet been able to discern. But, sure enough, there’s the coccyx, dead-ending at the Panama Canal! At the risk of being long-winded here, I’d like to include the blog post I wrote on February 12, 2009, during my four-month exploration of the Andes. I had announced that I was determined to “perform Chiropractic” on the spine of the planet and was very deliberately banging my boot soles on the cobblestones; and, mindfully, dancing in the shower or the rain. I certainly hope that helped. It may be a little too early to tell! Before I left home, I decided to see what I could do with this amazing similarity of South America to the human spinal column as I I traveled between Colombia and Patagonia. I obtained a Chiropractic diagram of the spinal cord, outlining all of the nerves as they pass through each vertebrae to the organs which they serve. Then I, arbitrarily, divided the Andean Cordillera into twenty-seven vertebral chunks and marked up my larger folding map, so that I could tell “which nerve I was on” at any given time. My hope was to pick the brains of the people I met down here to get their input on this amazing coincidence. 1. The C-1 nerve, serving the human brain, is located at the top of the neck. What illegal product, affecting what organ, is Colombia famous for? 2. The Amazon Rainforest is generally spoken of as the “Lungs of the Planet” because of the oxygen exchange performed by so many tree leaves. This jungle fills the Chest/Breast of South America in the Thoracic region containing nerves for the lungs. 3. Cusco, Peru, near Machu Picchu, was founded by Manco, the Incan Emperor, who stated that this was the Bellybutton (Navel) of the world. Well, at least it’s opposite the east coast region of the umbilicus, which might be imagined to sit below the large breast of Brazil. 4. Lake Titicaca, is one of only a few massive inland, freshwater lakes, navigable by large ships. How interesting that it sits right in the bladder’s nerve area! 5. Everybody knows about the metal mining and the acres and acres of salt flats in Western Bolivia, where the train runs endlessly across white land. Kidney nerves are there and that’s the organ which removes salt and minerals from our blood. 6. The tip end of the continent, near Punta Arenas and Tierra del Fuego, forms a perfect sacrum and coccyx, which mirrors exactly the profile of an actual spine. I’ve had some good conversations with locals along the way. No one seems to have thought of this similarity before. And nothing comes up in a Google search. Right now, I’m sitting in the T-3 vertebrae, where the nerves affecting the lungs and bronchial areas are; and I’m dealing with a chest cold and cough. Maybe I should blame the cold, 4800 meter Cotopaxi Volcano mountain which I climbed a week or two ago. It’s time to stop and leave this open-to-the-street internet, too full of auto exhaust; which one must get used to very quickly in these cities with narrow lanes and high building walls. All gases get breathed in by each of us poor humans, just trying to exist without enough rainforest to process all these toxins.